Why pay hundreds of dollars to automate your home, when you can automate it for free with existing tools/computers that you might already have in your garage? 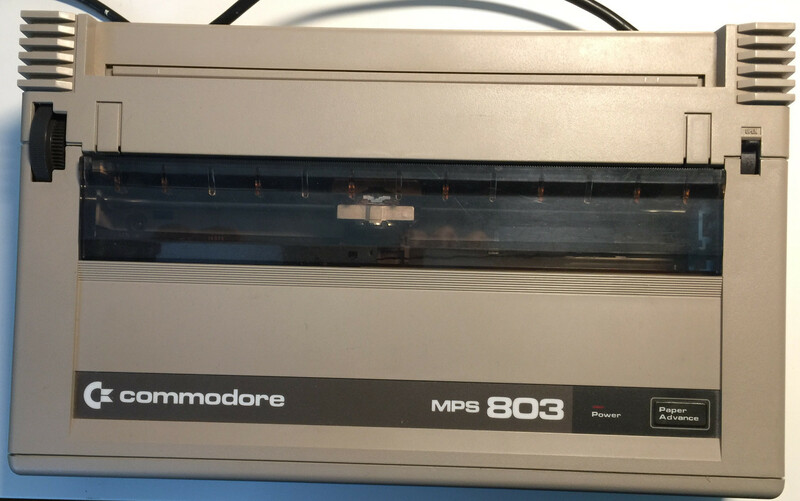 Automate your home using a smartphone, a Commodore 64 and a dot matrix printer! It comes preloaded with classics from the 80’s, like Billie Jean, The Final Countdown and Pop Goes the World. Listen to the unmatched chiptune sound. 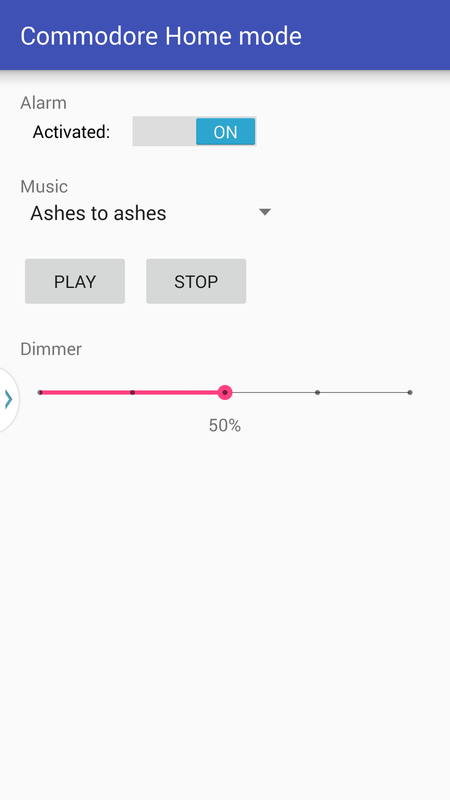 Control the music player from your smartphone! Don’t pay hundreds of dollars to have “smart” light bulbs. Instead, control them with your dot matrix printer! 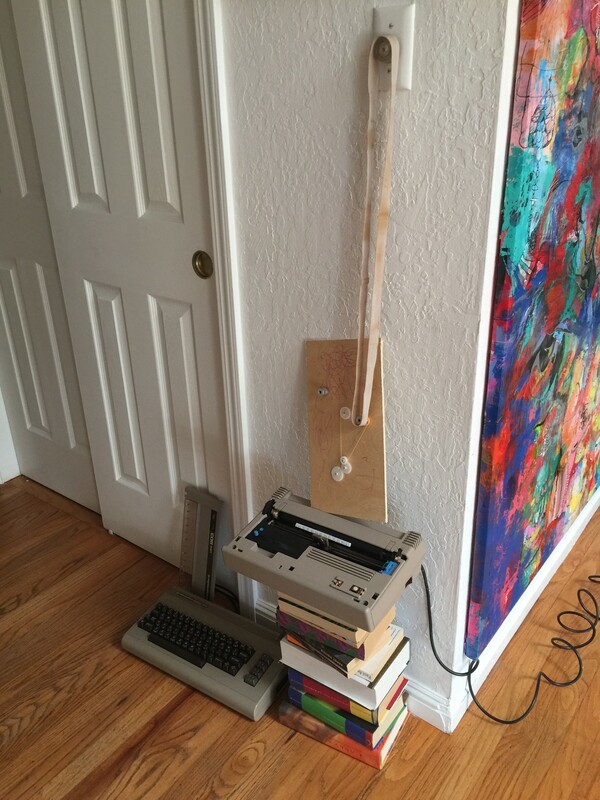 Attach a few pulleys and gears to your printer header, and control the lights and dimmers from your smartphone! It is possible to control more than one light by daisy chaining the printers! How handy! Know when an authorized person enters your home. 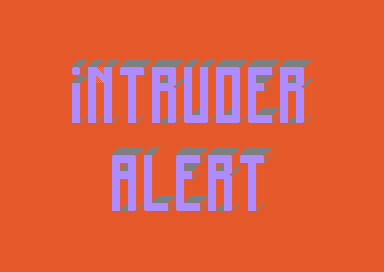 A siren sound + a blinking “Intruder Alert” screen will be displayed on the C64. Future versions will have modem support: When an intruder is detected, it will dial your favorite BBS and leave you a message there. How handy! Commodore Home uses the UniJoystiCle technology to communicate with the C64. It is a device that allows you to control the two joysticks from your smartphone. The instructions to build and setup one are here: DOCUMENTATION.md. (Ping me if you want an already built+assembled+tested unit. I sell them for $40+shipping). 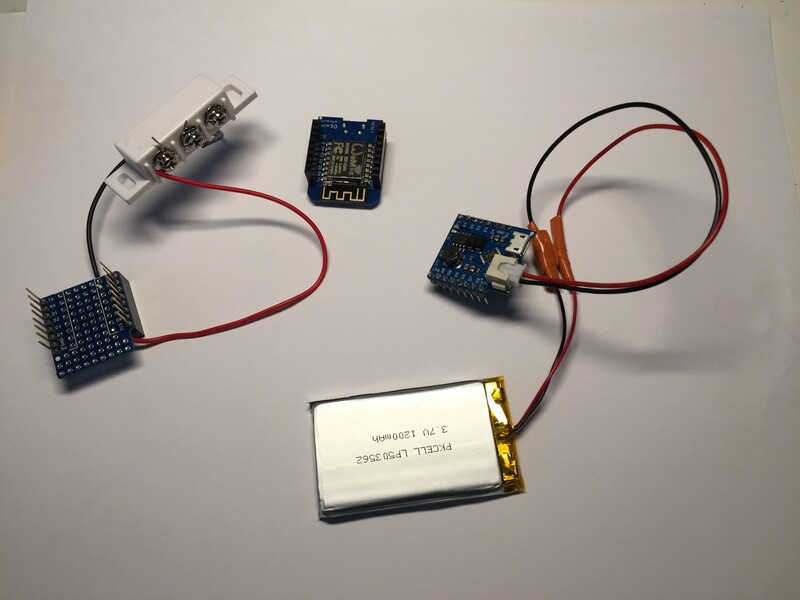 It consists of a magnetic sensor + WiFi device. 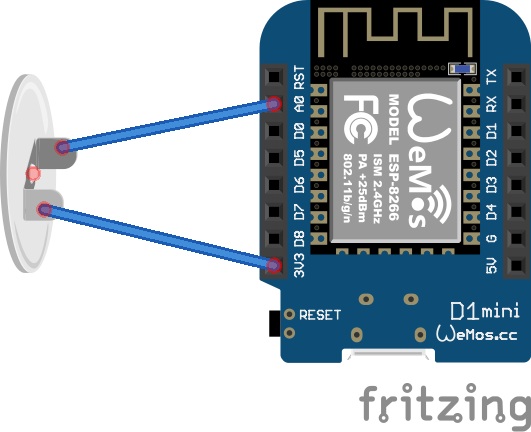 When the sensor is open, the WiFi device will send the “trigger alarm” command to the C64. Connect “A0” (analog input) to the NC (Normally Closed) magnetic pin. And connect “v3.3” to the Com magnetic pin. (pre-compiled firmware coming soon. done: see below). …and done. The alarm system is ready to go! If you don’t have a UniJoystiCle WiFi device, it can be controlled with the keyboard. Just DO NOT use it with a joystick in port #2. If there is an error with the printer (like printer not connected), it will change the border color. The iOS and Desktop UniJoystiCle applications don’t have the “Commodore Home” plugin yet (coming soon. done: see below). Just connect the printer as device “4” (not “5”). Insert a piece of paper (doesn’t work without one), and connect the gears to the printer header. It was tested with the MPS 803 printer and it works Ok. But it doesn’t work with the Okimate 10 printer since it places the printer header back to the left after each command. So, use the MPS 803. I knew how to move the printer header using the BASIC “print#” command. But I had to do some research to move it using assembly. Used VChar64 to design the screens/fonts. I didn’t compose the songs. I grabbed them from HVSC. 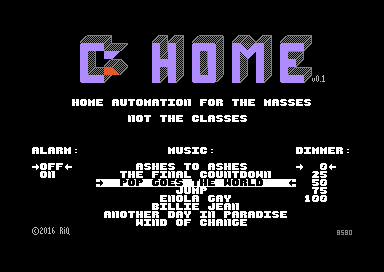 Wrote the “Commodore Home” UniJoystiCle plugin. It replaced the old “Linear mode” plugin. It was mostly a copy & paste from the UniJoystiCle firmware that I did before. 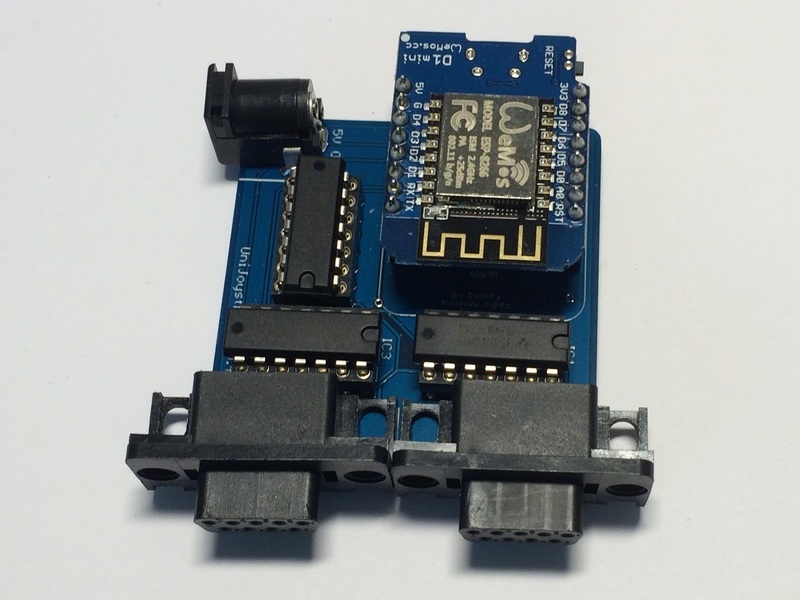 Quick and dirty design: using the A0 (analog pin) from the ESP8266. I was able to have a working prototype using the “linear mode” but in the end I haven’t used it. I’ll continue working on it later. It will be useful for UniJoystiCle users. Designed v0.4.1 during the Retro Challenge, but I received the PCBs only two days before the deadline. 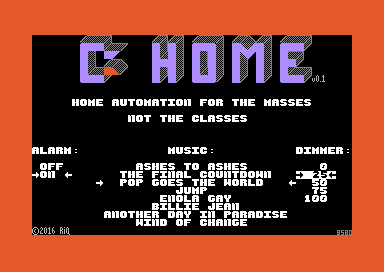 So, for Commodore Home I used the previous version (v0.4.0). I was able to move the dimmer knot with pulleys+gears. Only by moving the gears manually. I didn’t have the time to attach the toothed bar to the printer header. Decide what to do from day 1. I started building the C64 I.D.IoT.R project, but ended doing the Commodore Home, a more challenging project. I built the “desktop client” for the C64 I.Di.IoT.R (took me like a week) and in the end I didn’t use it. Manage my time better. Don’t work until late. I wake up at 6:00 / 7:00am no matter what. iOS/Android/Desktop client: Add voice support for the smartphone. You should be able to control the C64 by saying “Hey Commodore, activate the alarm”. C64 app: Add sound support for NTSC/PAL-N. Right now it only sounds Ok on PAL-B. 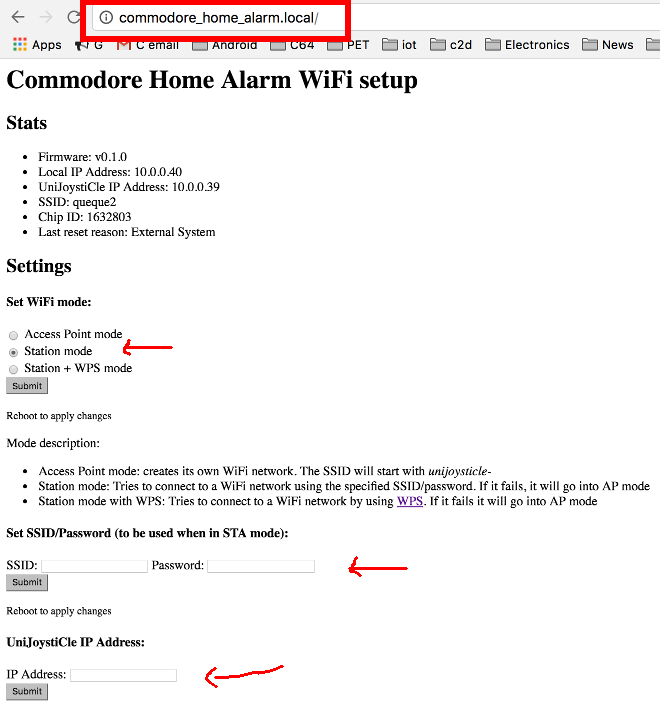 C64 app: Add modem support: when the alarm is triggered, it dials a BBS or something. 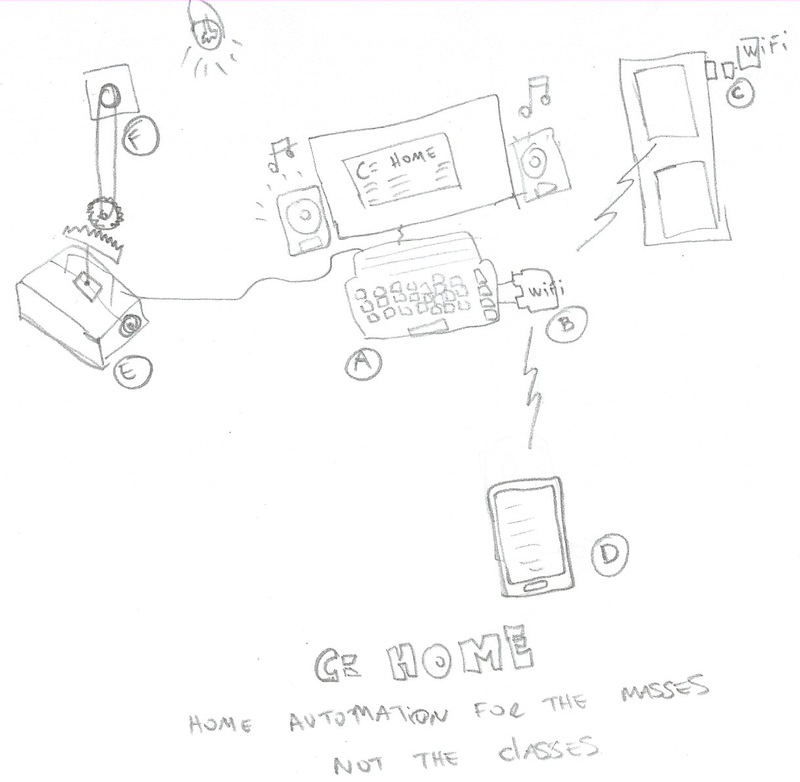 Create a video mocking Google Home, Amazon Echo and other home automation products. Add support for unlocking/locking doors with the printer.